Paintings by John J Marshall. Text by Robert Armstrong. 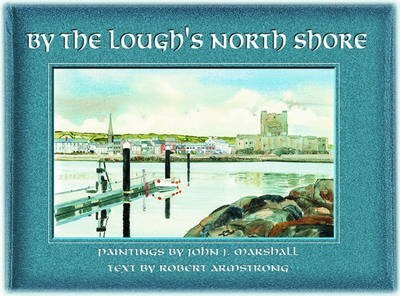 FEATURING a lovely padded cover and full of beautiful illustrations, By The Lough’s North Shore is an excellent read. It forms part of a much-complimented illustrated book series on various areas of Ulster and Eire. By The Lough’s North Shore, would be of great interest to anyone who knows the general South East Antrim area – specifically Carrickfergus – as it prominently features Carrick Castle, the Andrew Jackson centre and the King Billy statue by the castle. The book starts with an extensive and fascinating history lesson. Entitled The People of the North Shore Part 1 it recounts how – around 7000 BC – nomadic people travelled across Europe searching for a new homeland. It’s believed that they first set foot in the area around Larne. The history lesson continues with a detailed look at the invasion of the Celts (in the 5th century BC) and the introduction of Christianity, by Patrick in the 4th Century and the later arrival of the Vikings and their descendants, the Norman’s. The book is cleverly set out in a geographical manner – starting with Belfast Castle and ending with Black Head Lighthouse. It means that readers can ‘do a tour’ of the area. Sites visited have two pages devoted to them – one of text, the other an excellent painting of the subject matter. This combination works really well, it makes you want to turn the page to find out what’s next on the ‘tour’! There are a lot of areas that would be of great interest to those who want to know more about Carrickfergus itself. For instance, Carrick gets its name from Fergus – the son of Eric of Armoy – who left Ulster to form a kingdom in Scotland but because he suffered from leprosy returned from time to time to bathe in a well which apparently had healing properties. On one of these visits he was shipwrecked on the rock, on which the castle is built thereby creating the name ‘Carrickfergus’, meaning ‘the rock of Fergus’. Incidentally, it’s believed that Fergus’ healing well is the one still surviving within the Castle. “The importance of Carrickfergus Castle in a international context is epitomised by the involvement in its story (at various times) of a German General (Fredreich Schomberg), a former Dutch Prince (King William III), a French Commodore (Thurot) and an American Privateer (John Paul Jones) who is credited with being the ‘founding father’ of the American navy. The book also takes in the statue of King Billy, Carrickfergus Town Hall and The Andrew Jackson Centre. It ends with another detailed history lesson, The People of the North Shore Part II. This looks in some detail at the Norman influence in Ulster. The Plantation, King William III, the United Irishmen, Home Rule, the Somme are also examined. There’s some interesting social history as well – such as the development of Rathcoole and the rise and fall of multinational companies such as ICI at Kilroot. provides an excellent snapshot of the general South East Antrim area. It’s guaranteed to make readers want to learn more about the general area and the specific sites it highlights.